We should take a few days a year to reflect on the dark parts of our history. Telescopes on Mauna Kea, Hawaii, February 2008. A massive debate has erupted about whether to build a giant new $1.5 billion telescope on the summit of Mauna Kea. Native Hawaiian protesters have blockaded the site, claiming that the 18-story–high structure is being built on one of their sacred spaces. The governor has temporarily halted construction. I’m a physicist turned writer who specializes in finding stories of how science has affected people’s lives. I’m disturbed that this conflict came as a surprise, and disturbed about what that says about the culture of science. I’m disturbed by how scientists see ourselves as separate from culture and history, unaffected by it, and not responsible for its ills, and I wonder what we can do about that. Our news is dominated by misery: wars and injustice and the daily grind of our banal horribleness to each other. We see invasions and racism and misogyny, drought and starvation and refugees. To many of us, science offers a respite from this, a place of curiosity and wonder. There is incredible solace in knowing that the objects of our study—the light from galaxies, the quarks and gluons bound into protons, even the chemical bonds in the strands of our DNA—are oblivious to these things. It’s one of the great joys I took as a particle physicist, knowing that what we studied was universal, true for all things and all people. Because of that, though, there is an incredible temptation to believe that because these things are universal, by studying them we transcend the issues of people, that we ourselves become universal, not subject to or responsible for the troubles that surround us. But just as the laws of physics are the same on Earth and in the skies, just as the stuff of matter is the same in the interstellar dust and in our bodies, so the tides of history and the nature of people are the same in the sciences and the rest of our society. And so transcendence can take the form of blindness to differences between people and to our own biases. We assume scientists all think and believe the same things, even beyond the unequivocal data. We are all equal as scientists if we all value the same principles. And what we value comes almost entirely from Enlightenment-era Europe. This is a troubling state of affairs if we claim to strive for all humanity. One time when I was sitting in the cafeteria at Fermilab, for decades home of the world’s largest particle accelerator, I looked around and noticed that I was surrounded by people from a dizzying array of countries, and I realized I could have a conversation with any of them. We all spoke fluent physics. That is indeed a wonderful thing. But is the culture of physics a place where many different people come together around a common goal, or a place where anyone is welcome as long as they act and believe the way everyone else does? It’s a fine distinction, but a vital one, and I think the answer is the latter. As you drive into the main building at Fermilab you pass a row of flags from all countries represented by scientists working at the lab. The American flag is much bigger, and set apart. Even there, at the heart of fundamental, pure research, done out of the joy of discovery and firm belief that knowledge benefits all humankind, we make clear that we—in this case the Americans who run the place—think we’re better than everyone else. We scientists are not apart from these things. Our cultures matter. The history that brings people to a particular moment is important. The debate now about the Thirty Meter Telescope on Mauna Kea is not just about the specific location. It’s about a resurgence of Hawaiian culture and self-determination after more than a century of oppression. Telescopes were a part of that. In 1893, Europeans overthrew the government of Hawaii in a coup d’état. In 1896, the Hawaiian language was banned. In 1941, the U.S. military base at Pearl Harbor was bombed by Japan. In 1959 Hawaii was made a state of the United States of America. In 1968, the first telescope was built on Mauna Kea by the U.S Air Force. In the 1970s, native Hawaiians were evicted from their homes to make way for high-income and tourist development. In 1976, protesters occupied Kaho’olawe, the smallest of the main islands, to oppose its use as a bombing range; two protesters were killed. In 1998, the legislature attempted to ban the gathering of plants used in the traditional hula dance. 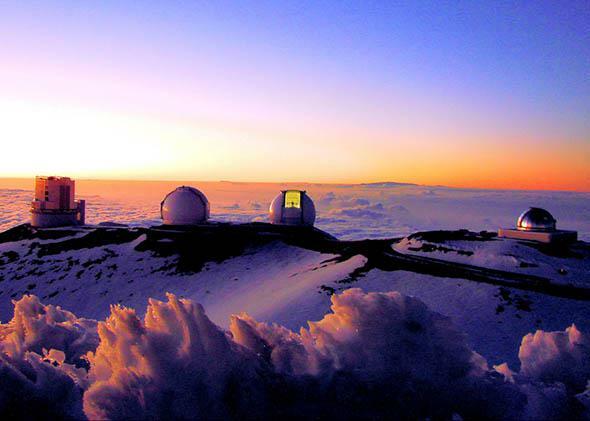 In 2002, the 13th telescope on Mauna Kea was completed, also to protest. There are vastly more stories than these of people dismissing Native Hawaiian rights and concerns. The debate about the new telescope is also about rituals and sacred places. I think as scientists we miss the importance of ritual, in part because we see ourselves as people who have gotten past such things. Of course that’s wrong. Like all people, we create patterns in what we do that reflect who we are. We have thesis defenses and colloquia and conferences. We have Darwin Day and Science Festivals. We preserve Newton’s Tree and Da Vinci’s notebooks and Galileo’s middle finger, as if it’s a relic from a saint. Like all rituals and sacred things, these are declarations to the world and to ourselves of who we are and what we value. That is what’s at stake here. Building on Mauna Kea is not just building on a historical site, it is changing the nature of what it means to be Hawaiian, a change imposed from the outside. Every scientific field has contributed to terrible things. Physicists, driven by curiosity and joy, discovered the structure of the atom, and with that created the atomic bomb. Chemists can create devastating weapons with the same knowledge that makes life-saving drugs. Computer scientists erode our privacy with the same tools that allow unprecedented communication between different peoples and different cultures. Doctors, the great symbol of direct benefit of science, ran the infamous syphilis study at Tuskegee, where they watched black men die without treatment for the sake of data. Just this week, we learned that the American Psychological Association may have worked to legitimize torture. And yes, astronomy has its evils, and as with Mauna Kea, they are often connected to mistreatment of native peoples. In the center of the Arthur Ross Hall of Meteorites at the American Museum of Natural History sits Ahnighito, a 34-ton, 4.5-billion-year-old meteorite. It was used as an iron resource by the Inuit in Greenland, until Robert Peary stole it in the late 1890s. Today it sits in the museum in a place of pride and with no sense of shame. The description in the museum is a plaque that says that it was “discovered” in 1894, the year Peary saw it, and a slideshow in the hall talks of an Inuit leading him to it, presenting it as heroic discovery, not theft. We have telescopes on Mauna Kea because of the coup in 1893; we could only build Fermilab in Batavia, Illinois, because a century earlier that land was stolen from the Sioux and the Miami. The engine of the Western economy owes much to injustice and exploitation, and that economy funds our science. There is a strong temptation here to say, these things were not done by us! Ahnighito was stolen by one man, long dead, not by us. The bombs were created two generations ago, not by us. But we scientists take credit for the good. We found a cure for smallpox, and eliminated it; we invented the computer and fiber-optics and through them connected the world; we discovered the expansion of the universe and our place in it by analyzing the light of galaxies. The authority of science, the pride we take in our tradition, the claim that we create good in the world comes from these things. There is a “we” that did them. We, now, are attached to them because those people are our intellectual ancestors. But those ancestors are exactly as close to us as the others are, those who created evil. If it was we who discovered the expansion of the universe through the redshifts of galaxies, then it was we who stole Ahnighoto. If it was we who understood the nature of the atom, then it was we who bombed Hiroshima and Nagasaki. If it was we who cured smallpox, then it was we who ran the experiment at Tuskegee. We can’t choose our heritage, but we can choose how we live with it. In that respect, I think that we cannot in good faith take pride in the light if we do not also take responsibility for the dark. But I do think we can fix this. Over the past weeks, I have seen an extraordinary amount of soul-searching and questioning. I have seen people declare in public that their research came from a place of harm. I have seen a community wrestling honestly with a difficult and painful question, of whether to give up a precious goal so other people might reclaim their heritage and receive relief from centuries of oppression. An astronomer friend tells me that astronomers dream giant dreams, decades long in both planning and execution, and that this loss will be sharply felt. Perhaps I am naive, but I think we are capable of great feats of spirit as well as engineering, and I want us to attempt them. I want us to be as great in our generosity as we are in our ambition. I think I know how to plant the seeds from which new giant dreams might grow. We have created rituals of celebration and analysis and communication, and we are very good at them. What we, as scientists, haven’t done is to create the rituals of darkness. We have no rituals of reflection, of repentance, of atonement. It’s a small thing. But I think if we do this, year after year, we can remember the missteps in our history, and more than that, the importance of thinking about them alongside the science. Let us all—scientists especially, but anyone who enjoys science or benefits from it—take the time to reflect on the evils that have enabled our work, the evils that have been done with it, and the ways that we can ensure that never again will such a payload exist, that never again will such an aircraft take flight, that we ourselves shall never become such a vessel.